I got a chance to try out a pre-release version of the software—here are some of the changes in the new version. Roxio has cleaned up the interface in Popcorn 4. Instead of the sidebar with two headings (DVD, Player) and various options under them in Popcorn 3 ( ), the new version introduces Copy and Convert tabs. The options are the same from the previous version, with the addition of an Audio Files option (more on that shortly). In general, the look is much more consistent with that of Toast 10 Titanium, with the same controls, Media Browser, and more. Popcorn 4 also adds pop-up descriptions to explain what each option does. As with Toast 10 Titanium, Popcorn now lets you capture many streaming videos from the Web. From the Media Browser, you choose the Web Video option in the pop-up menu. Then you load a Web video in your browser (you don’t actually have to watch it, just let the progress bar run to the end) and it becomes available in the Media Browser to drag into the main window and convert for, say, viewing on an iPhone. Popcorn's Media Browser after capturing several Web videos. To test it out, I captured two H.264-encoded videos (one on YouTube and another embedded on a Web site from Vimeo) as well as a Flash-encoded video from the White House Web site. All three worked just fine, and I was able to convert them to play in iTunes and on my iPhone. Popcorn 4 also makes a few improvements to the actual encoding process. You can now schedule conversions (which are very processor intensive) for times when you may not need your CPU cycles as much. When you click on the Schedule button in an export options window, you can specify At Exact Time (you pick the date and time for encoding to begin) or Countdown (you pick how many hours and minutes from the present time exporting should start). After making your selection, the application minimizes into your Dock, and displays a small clock in its upper right corner. When the time comes, the app reemerges and encoding begins. 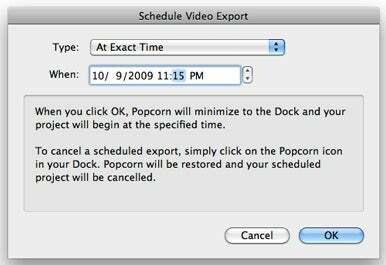 In order to cancel a scheduled encode, all you need to do is click on the Popcorn icon in the Dock. Unfortunately, if you accidentally click on the Dock icon, you have to schedule the encoding again from scratch. Popcorn 4 offers the option to schedule video encoding for more-convenient times. Roxio has also updated video-quality previewing. In Popcorn 3, clicking on the Preview button in an export options window would generate a clip of the first 15 seconds of your video with the current encoding settings to preview. Popcorn 4 adds a Preview Options item with a disclosure triangle next to it. Click on the triangle and you’ll see options for preview duration (15 seconds, 30 seconds, 1 minute, 2 minutes), what part of the video to start with (Beginning, Middle), whether or not to save the preview, and where to save it (your Movies folder, your desktop, or your Documents folder). The new options give you a better sense of what your video will look like, and having the ability to save previews for comparison is nice (the software appends _PREVIEW_ONLY to the file to make it clear that it’s a preview). The beta version I was using deleted saved previews from my Mac when I closed the encoding window, but Roxio says that’s been fixed in the release version. Popcorn 4 also adds support for Elgato’s Turbo.264 HD ( ) hardware video encoder (Popcorn 3 worked with the previous, non-HD, Turbo.264 model). The new DVD clip extraction interface. 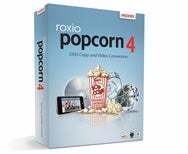 In terms of conversion options, Popcorn 4 adds support for dealing with AVCHD, AVDHC Lite, and MKV video files; new export presets for devices such as the Nintendo Wii and Palm Pre; and the ability to export directly to YouTube and in Flash format. As mentioned earlier, Popcorn 4 adds an Audio Files option (under the Convert tab) that gives you the ability to convert audio files to or from AIFF, WAV, AAC, Apple Lossless, FLAC, or Ogg Vorbis. 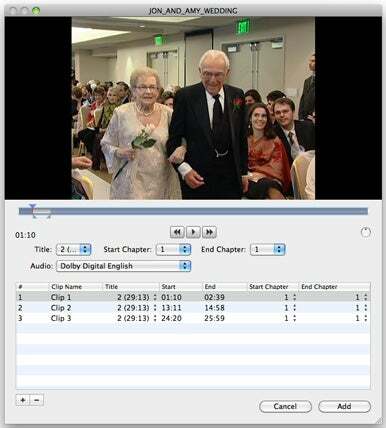 The other news on the audio front is that you can now extract just the audio content from a video DVD—useful if you want to, say, listen to the songs from a concert DVD on your iPhone and make an AAC file from a speech on a homemade family DVD. As with video, you drag your VIDEO_TS folder into Popcorn, but this time into the Audio Files window. The interface looks exactly the same—there’s no indication you’re working with only audio—but when you finish setting everything up and click on the Add button, Popcorn extracts the audio you selected and then lets you set fades and apply Audio Units effects before exporting in one of the audio flavors mentioned previously. Although you can choose to export individual chapters, I had trouble setting the start and end chapter marks using the pop-up menus in the interface. Instead, I had to adjust the clips once I'd added them to the clip list at the bottom of the window (this may be fixed in the final version). Popcorn also includes an updated disc labeling application, adds cutting and trimming to its TiVoToGo extraction tool, and offers the same TiVoToGo functionality as Toast 10 for streaming video to a Series 2, Series 3, or HD TiVo.